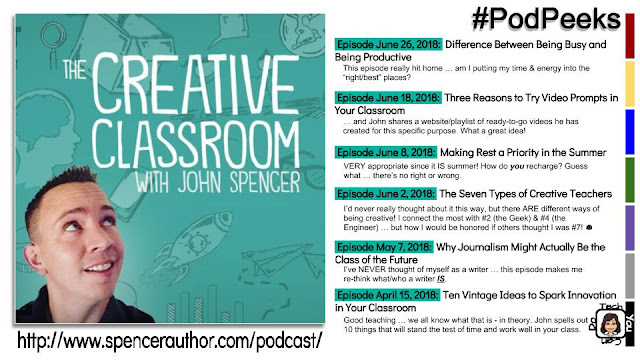 This week, I have been binging on John Spencer's podcast - The Creative Classroom. My walk this morning ended up going a little bit longer so I could finish an episode! This is a newer podcast for me and extremely good! He is such a source of inspiration. His episode "Difference Between Being Busy and Being Productive" really hit home ... this week. We are fully into July and summer is in full swing. I was out for a walk while listening, and I really had to stop and think, "Am I 'busy' or am I 'productive'?" The other one that really spoke to me big time was the June 2 one - The Seven Types of Creative Teachers. While I relate to several of them, I think I'd ideally like to be #7. What about you? John's podcasts compliment his blog posts. AND he has a YouTube channel that goes along with many of his podcasts/blogs. I highly recommend you check out - and subscribe to - his YouTube channel, his blogs, AND his podcasts.